Common wisdom states that if you see a mountain lion chances are it has already seen you and probably for some time. 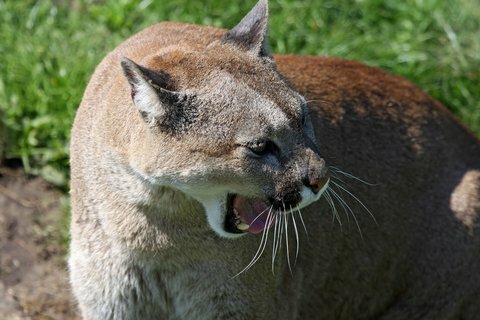 Mountain lions – also known as cougars, pumas or panthers – are some of the most frightening animals you can encounter in the North American woods as the below videos certainly demonstrate. Cougars stalk their prey and can weigh more than 200 pounds. They also have the same cunning and agility as the common house cat, a combination which is downright terrifying. Experts say the best way to avoid a mountain lion attack is to make noise to scare the lion off and try to appear larger than you are. The same advice typically applies to bear encounters as well. Never turn your back on either and it’s a good idea to carry bear spray or a gun as a last resort. If you’re carrying a gun, fire a warning shot before taking the kill. The following videos posted to Youtube in recent years provide a blood curdling look at some close encounters. The mountain lion crouched down as if it was about to make a strike and then sauntered off the trail toward the brush. Next up is Donnie Stone, a jogger in Grand Prairie, Alberta. Stone’s incident is a good example of how running or turning your back on a mountain lion will actually make it give chase. Stone noticed the cats in the bushes as he passed by and then quickly realized he was in the danger zone when he heard a rustle behind him. Without hesitation Stone fired a wall of pepper spray at the cat, which deterred a potential attack. “Had I not had the bear spray out with my finger on the trigger I’m pretty confident the cougar that did attack would have got me,” Stone told the local television news. A mountain lion expert at the University of Alberta, Mark Boyce, told the station run-ins with cougars are extremely rare. “It’s surprising in lieu of the fact that we have thousands of cougars and the number of human contacts is very few,” he said. Stone said he had always wanted to see them but this was a little more than he bargained for. By far the most terrifying clip we found shows a mountain biker in Fernie, British Columbia who comes face to face with a mountain lion along the trail. At first the lion is crouched down the grass, stealth-like and ready to pounce. The rider gets off his bike and backs away. Why on earth this guy doesn’t make some noise to scare the cat off is anyone’s guess. He stays real quiet, just like a prey animal and turns to run away. Not a smart move at all. When the man turns back around, the mountain lion is right in front of him!! Again, this guy does the absolute wrong thing. Instead of screaming and waving his arms, he calmly talks to it. The lion then creeps into the bushes where it’s hard to see before strolling away. At this point, the creator of the video apparently added the sound of a cat growling. Why they did this we don’t know? This guy had already demonstrated considerable lack of wisdom. The shaky camera shows just how scared this guy truly was during the encounter. Here’s a group of three cougars outside Powell River, British Columbia that was spotted by a pair of loggers. The cougars are apparently so hungry they are willing to approach the truck where the observers remain protected. These elk hunters managed to draw in a cougar by doing elk calls in the woods. Act like prey, draw in predators. This encounter by San Stukel in the South Dakota woods resulted in some extraordinary footage you have to see to believe.